You can Email us, click the "Contact Us" button or Call us on 0800 024 6113 for free! A door lock you’ve had for years, the window that has doesn’t close or lock properly. The patio door that only has a standard lock on it. all were secure and safe when bought but sadly burglaries are on the increase and these are all the easy way in to you home. Don’t worry though, securing your home is not expensive and will give you piece of mind that your loved ones and valuable are protected. Your UPVC and Composite doors are solid in their build but every door has a weak point. For most doors it is the lock. A “standard” lock can be broken and entry gained in under 10 seconds! YES UNDER 10 SECONDS! The solution to this is a 3* AntiSnap Lock, the highest rated lock available and one that will keep unwanted intruders out. o 6 reinforced trap pins for sustained resistance against plug manipulation and picking. 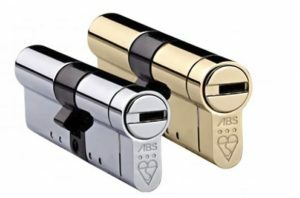 o The internal part of the lock doesn’t have any sacrificial sections ensuring that it’s as strong as possible after an attack. o Patented break secure technology housed in a tough Molybdenum casing that creates a total barrier in the lock mechanism if attacked. o Designed to withstand high impact on attempted forced entry and proven to secure. 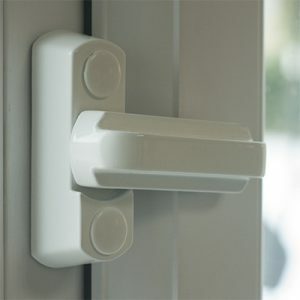 Sash Jammers are a great security feature, cheap, easy to use and add extra security to your home. Sash Jammers are installed internally to your rear doors and any windows and add an extra securing feature to them requiring massive force to open them even if the primary lock is left open. Sash Jammers can be used on doors, windows (swing and tilt & turn and patio doors). Security cables are another easy to use security feature that will keep your window secured even when open. They are installed internally and with a clean finish they blend in with your windows and keep the aesthetics of your home. 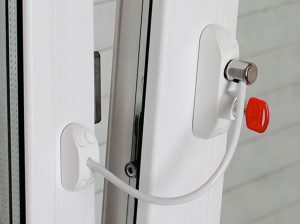 As with Sash Jammers Security Cables can be used on doors, windows (swing and tilt & turn and patio doors). Simple, Effective and Clean. 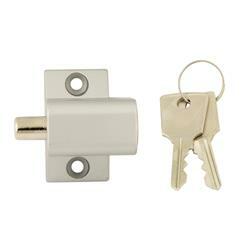 Stop your door sliding open even if the primary lock and/or mechanism is damaged. Copyright © 2018 Window And Door Surgeon All Rights Reserved.